We make solid wood simple benches. 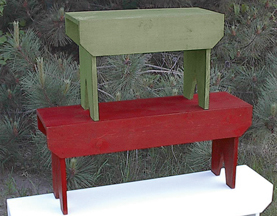 Farm benches, country benches, rustic pine benches, painted wood benches, we have them all! Fun to use for actual seating, or as a display. Try stacking these wood benches in different color choices for unique shelves! They may look like simple benches, but they're also solid pine with quality construction so they're made to be used and to last!